Lower exports and higher imports expected to push agricultural trade surplus below $10 billion in 2016. 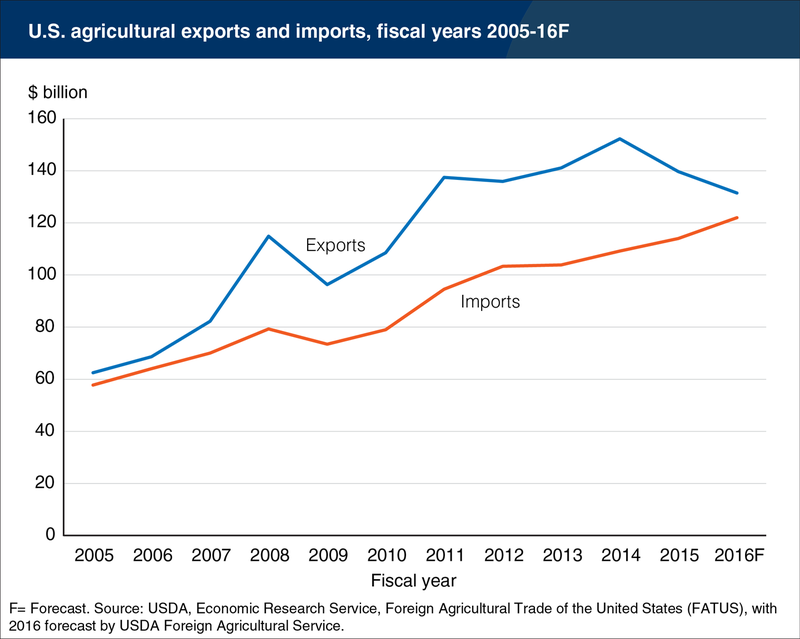 The value of U.S. agricultural exports and imports increased each year from fiscal year (FY) 2009 through FY 2014, when the agricultural trade balance reached an all-time high of $43.1 billion. However, the U.S. Department of Agriculture’s recent “Outlook for U.S. Agricultural Trade” shows that the value of agricultural exports fell 8.3% in FY 2015 while imports grew by 4.5%, cutting the trade balance to $25.7 billion. USDA projects the pattern to continue in FY 2016 as reduced exports and more imports are expected to push the agricultural trade surplus below $10 billion for the first time since 2006. Lower commodity prices account for some of the decline in the value of exports, USDA noted, but a stronger U.S. dollar also plays a role. Additionally, China’s economic slowdown will have a trickle-down effect throughout the global economy and ultimately will affect the U.S.
“Unlike in 2009, when both exports and imports fell due to the global recession, in 2015 and 2016, imports are growing at the same time that exports are falling, reflecting the greater purchasing power of the U.S. dollar in international markets and the reduced purchasing power of foreign currencies to buy U.S. goods,” the outlook report notes. FY 2016 agricultural exports are forecasted at $131.5 billion, down $7.0 billion from the August forecast and $8.2 billion below final FY 2015 exports. Most of the decline is accounted for by lower prices, strong competition and diminishing demand from China, USDA said. Grain and feed exports are forecasted to fall $3.8 billion to $28.6 billion, with exports of coarse grains, feeds and fodders down a collective $2.3 billion as decreasing trade prospects with China sharply reduce exports of sorghum and dried distillers grains with solubles. USDA lowered the forecast for livestock, poultry and dairy by $2.2 billion largely due to depressed prices for beef and pork spurred by increased supplies.